The Post Receivings Transactions application transfers all transactions previously created in Receivings Processing from the P/O Transaction File to several files and accounts. Among the files updated are the I/M Item File, and I/M Distribution to G/L File. Receivings transactions are also posted to the I/M Transaction Audit File if the Audit Trail On Inv. Transactions ? flag is set to Y in I/M Setup. 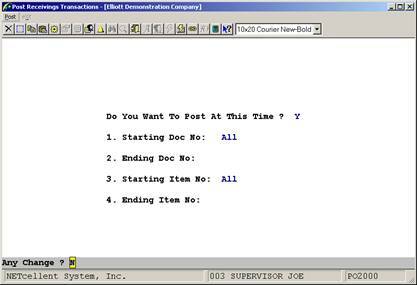 The application automatically generates a journal of all transactions posted during a run. The journal provides essentially the same information as the Receivings Processing Edit List including purchase order number, item number, G/L accounts effected, unit and total cost. Note: This application will only be used if P/O is set up for batch receivings processing. The Online Update Receiving Trx ? flag in P/O Setup must be set to N for the system to allow access to this application. * Select the desired mode from the Post Receivings Transactions menu bar. 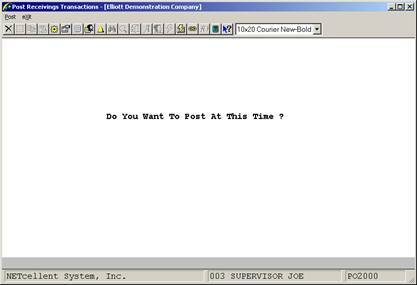 Do You Want To Post At This Time ? Enter Y to post all receivings in the Transaction File to the appropriate files. Defaults to N.
Why Receiving Non-Inventory Items in PO Will Cause General Ledger Inventory Account Out of Balance? When does the Purchase Line History data get updated? Can I Edit the Ship Date Field in PO Line Item Screen? Feature - Ability to Create a CSV Export in PO Edit List When "Show Headers Only" = "Y"